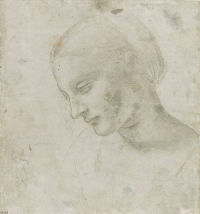 This wonderful metalpoint study, which is thought to have been used as a preparatory study for the Madonna Litta, is a confident exploration of the anatomical, three-dimensional structure of the female head. The three-quarter profile and downward inclination confer great emotional expression on the gentle, refined features of the face, making this an ideal type of head for paintings of the Virgin. It is entirely conceivable that Leonardo retained such drawings in the workshop, which could be used by his apprentices in the production of small scale panel paintings of the Virgin and Child.